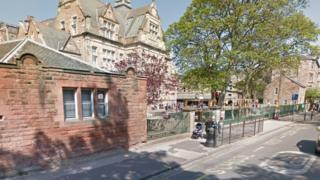 A pilot scheme to ban parking outside primary schools in Edinburgh has led to an increase in the number of pupils walking to school. Evaluation of the School Streets scheme also showed lower vehicle speeds on surrounding roads and a reduction in the number of cars around schools. A report to the city council's transport and environment committee recommended making the pilot permanent. The Living Streets Scotland charity wants it rolled out nationwide. The 18-month scheme began in Edinburgh in September 2015. The nine primary schools in the scheme are: Abbeyhill, Colinton, Cramond, Duddingston, Sciennes, St John's, Clermiston, St Peter's, and Towerbank. Living Streets Scotland said other councils should also look at implementing the scheme. It is not calling for a complete ban on cars around all schools as it said each should be considered on a case-by-case basis. Stuart Hay, Living Streets Scotland director, said: "We are calling on all local authorities to look at this scheme. "All local authorities have similar problems. "The main problems identified in Edinburgh were dangerous parking and manoeuvring by parents." Lesley Hinds, City of Edinburgh City Council's transport convener, said: "The whole aim of School Streets was to create a safer, more relaxed atmosphere around schools, encouraging children to walk and cycle and parents to leave their cars at home. "Therefore I'm delighted to see fewer cars around participating schools, slower speeds in nearby streets and more children walking in every day, contributing to a more welcoming environment for all. "We now want to build on the lessons learned from the pilot so far to bring School Streets' benefits to even more children, families and residents across the city."